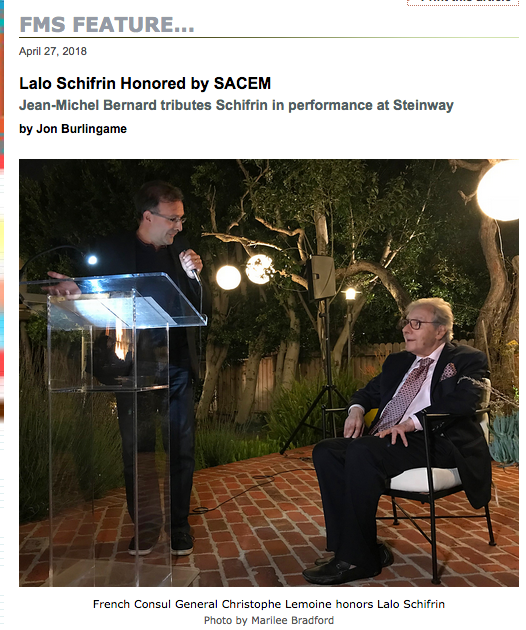 The great Argentinian composer Lalo Schifrin — creator of such classic film and TV themes as Mission: Impossible, Mannix, Cool Hand Luke, Bullitt, Dirty Harry and others — was honored by Steinway and SACEM the same evening in Beverly Hills. First, composer-pianist Jean-Michel Bernard performed many Schifrin tunes for a private audience in the Steinway piano showroom; then the home of French consul general Christophe Lemoine was the setting for a cocktail party and award presentation on behalf of SACEM, the French performing-rights society. Here is a review of the evening’s events. This entry was posted in Composers, Film Music, Television Music and tagged Film Music Society, French consul general Beverly Hills, Jean-Michel Bernard, Lalo Schifrin, SACEM, Steinway, The Film Music Society on April 27, 2018 by Jon Burlingame.